If you're looking for a foolproof way to garden with your children, even with limited space -- look no further than Click and Grow. 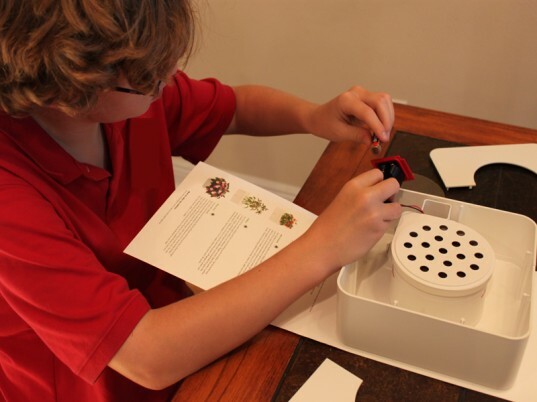 Click and Grow is a handy kit that enables your child to become a gardener in a simple process that requires only a few steps. 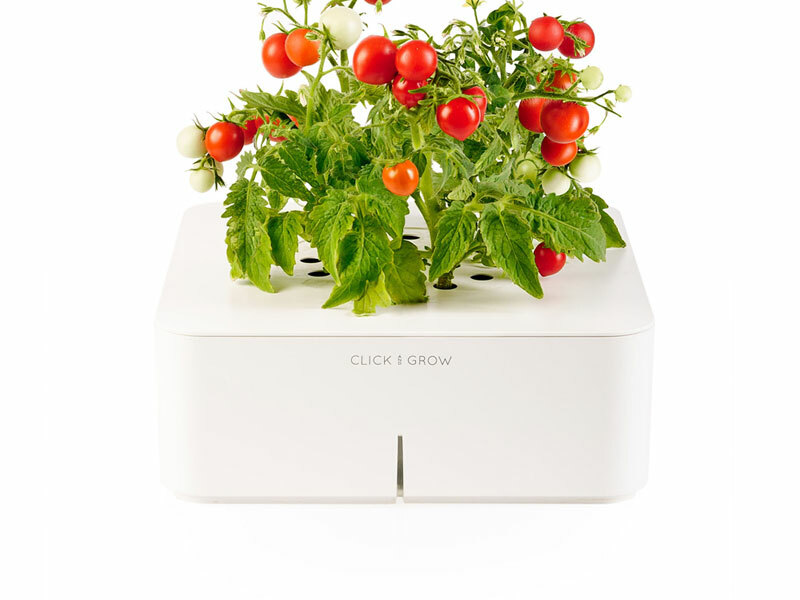 Available in several different varieties including mini tomatoes, chiles, flowers and herbs, Click and Grow plants are so easy to take care of, you can go away for the weekend or forget about them during the busy school week -- and they will still thrive. 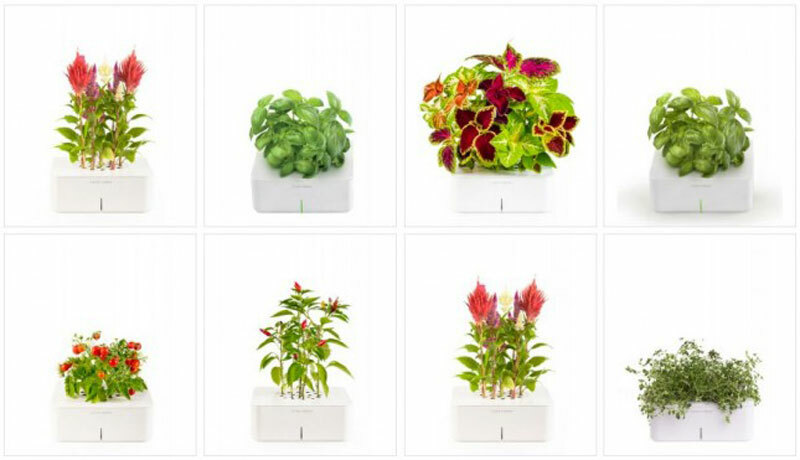 Click and Grow is a smart, self-watering flower pot that does the work for you. My son and I spent a few minutes after dinner getting our Click and Grow set up, and he has enjoyed watching the basil grow on our patio for the past couple of weeks. He checks the blinking light every day to make sure it doesn't need water. Besides that, it doesn't require any type of maintenance. The best part is, when you replace your plant with a new one, you don't have to throw away the pot. You simply replace the plant cartridge and wait for your new plant to spring to life. If you have a black thumb or lack the time and/or space to tend to homegrown plants, read on to see the Click and Grow in action. 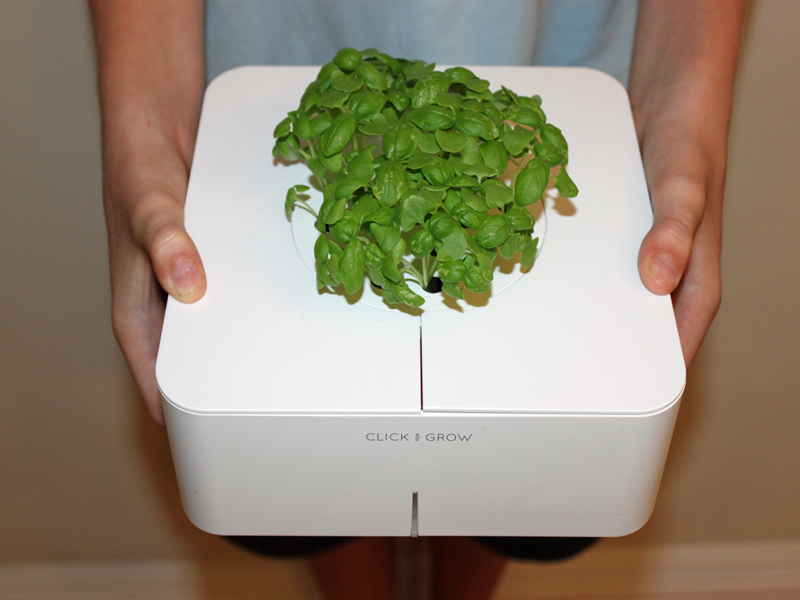 For our review, we were sent the basil Click and Grow Garden. There is an assortment of plants to choose from including; mini tomatoes, chili peppers, lemon balm, basil, lamb’s ear, coriander, sage and flowers. You can activate your Click and Grow online to track the performance of your plant and Click and Grow will provide you with accurate tips and guides of how to ensure that your plant thrives. You can also see where in the world other people are Click and Grow-ing. Remove the lids from the pot, insert 4 AA batteries into the battery vault. A blue light will start blinking, indicating that you inserted the batteries correctly. Fill the water reservoir with water — enough to fill the container to the indicated water level mark. The blue light will turn green and blink for 1 minute. Attach the lids, once you complete this step the green light will blink once every 5 minutes. Place the germination lens that’s included with the kit on top of the plant cartridge. It helps to create a greenhouse effect for more effective sprouting. You should remove it once the plants start to sprout. In 1-2 weeks, you will see super cute little sprouts appearing out of the top of your Click and Grow. My son loved watching our basil grow – and it’s so simple, I didn’t have to worry about the plant dying if we forgot to water it! 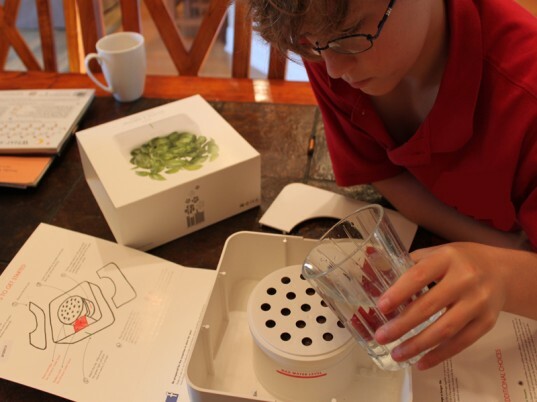 For our review we were sent the basil Click and Grow Garden. There is an assortment of plants to choose from including; mini tomatoes, chili peppers, lemon balm, basil, lamb's ear, coriander, sage and flowers. Fill the water reservoir with water - enough to fill the container to the indicated water level mark. The blue light will turn green and blink for 1 minute. 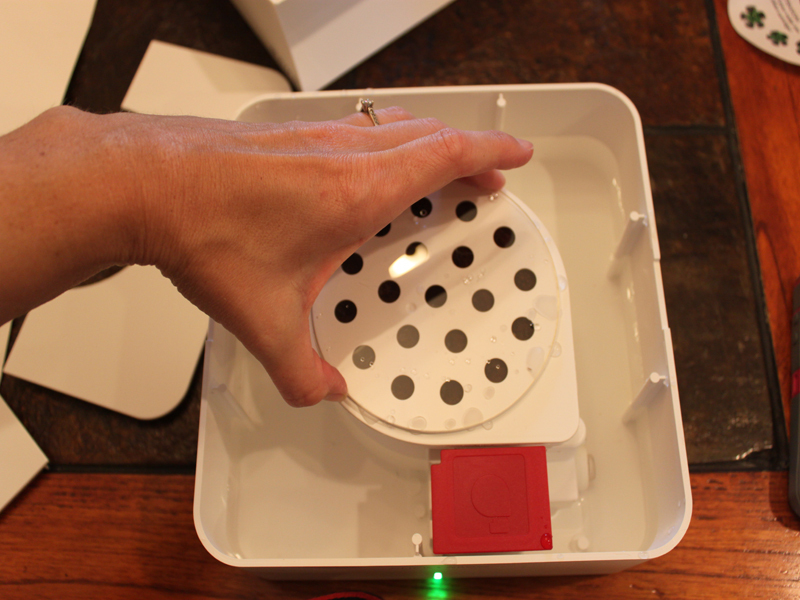 Attach the lids, once you complete this step the green light will blink once every 5 minutes. Place the germination lens that's included with the kit on top of the plant cartridge. It helps to create a greenhouse effect for more effective sprouting. You should remove it once the plants start to sprout. In 1-2 weeks, you will see super cute little sprouts appearing out of the top of your Click and Grow. My son loved watching our basil grow - and it's so simple, I didn't have to worry about the plant dying if we forgot to water it!